I’ve gotten so many compliments, questions, and pattern requests lately about the African Flower crochet motif I shared on social media recently. Some of you guessed correctly that it’s the African Flower motif while others commented that they look like jammie dodgers. Well the African Flower camp wins, although I do see the jammie dodger connection too!! To be precise though, it is only the first 3 rounds of the traditional African Flower motif. I left off the later rounds that turn the motifs into hexagons because … well … to be honest, since I just did a hexagon blanket I wanted to do a something a little different and I thought they looked pretty neat like this. And, since I am making this as coverlet for my bed and not really an afghan, I really didn’t need the coverage that the later rounds fill in. Want to give it a go? Long single crochet (Lsc): Insert hook in designated space and pull up a loop to height of row being worked, complete as single crochet. With CA, make a magic ring. Round 1: Ch 3 (counts as 1st dc), work 1 dc in ring, ch 1, *2 dc in ring, ch 1, rep from * 4 more times, join in top of beg ch 3, fasten off — 12 dc and 6 ch-1 sps. Round 2: Join CB in any ch-1 sp, ch 3 (counts as 1st dc), work [1 dc, ch 5, 2 dc] in same ch-sp as color was joined, *ch 1, [2 dc, ch 5, 2 dc] in next ch-1 sp, rep from * 4 more times, ch 1, join in top of beg ch 3 — 24 dc and 6 ch-5 sps. Round 3: Sl st in next dc and in next ch-5 sp, ch 3 (counts as 1st dc), work 6 dc in same ch-sp, *ch 1, work 7 dc in next ch-5 sp, rep from * rep from * 4 more times, ch 1, join in top of beg ch 3, fasten off — 42 dc and 6 ch-1 sps. Here is where I stopped for this project. To continue on with the traditional hexagon shaped African Flower motif scroll to the bottom of the page for the last 2 rounds. For the first motif only, join CC in the first dc of any 7 dc-grouping from Round 3, ch 1 (does not count as st), work 1 sc in same st as color was joined and in next 6 sts, *work 1 Lsc over the ch-1 sp from Round 3 and into the ch-1 sp from Round 2, work 1 sc in each of the next 7 sts, rep from * 4 more times, work 1 Lsc into the ch-1 sp from Round 2, join in first st of round, fasten off — 48 sts. For subsequent motifs, follow the same pattern as for the first, but when you reach the side to join, after working your Lsc, work 1 sc in each of the next 3 sts, ch 1, then drop the loop from your hook and insert it into the 4th sc of the motif you want to join it to, put the loop back on your hook and pull it through, now continuing to work back in your current motif, work 1 sc in each of the next 4 sts. Repeat this for the next petal of your motif. Each motif should join to another at 2 points. See the diagram below for placement of the motifs. 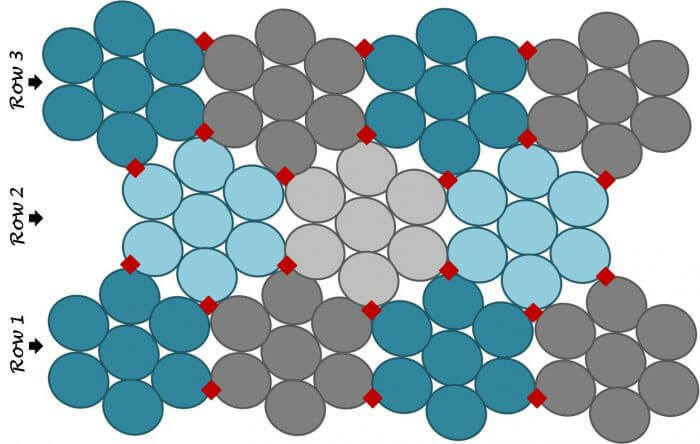 Joining points are indicated by the red diamonds. Round 4: Join CC in the first dc of any 7 dc-grouping from Round 3, ch 1 (does not count as st), work 1 sc in same st as color was joined and in next 6 sts, *work 1 Lsc over the ch-1 sp from Round 3 and into the ch-1 sp from Round 2, work 1 sc in each of the next 7 sts, rep from * 4 more times, work 1 Lsc into the ch-1 sp from Round 2, join in first st of round, fasten off — 48 sts. Round 5: Join CD in same st, ch 3 (counts as 1st dc), work 1 dc in each of the next 2 sts, *[1 dc, ch 1, 1 dc] in next st, 1 dc in each of the next 7 sts, rep from * 4 more times, [1 dc, ch 1, 1 dc] in next st, 1 dc in each of the next 4 sts, join in top of beg ch-3, fasten off — 54 sts. I would love to see your projects! Feel free to post up your pictures to my Facebook page. Hello, lovely color scheme and pattern! I actually can follow it, and that is an achievement for me. Is there any way you can put numbers by the red dots in the joining sequence? I can’t see it in my head. She, and the name she gave it, deserve recognition. I hope you will do so. Hi how many chains I need for the magic circle ? Gorgeous! Thanks for sharing the beauty. How many skeins of each coor? And what colors did u use? Hi! I love this pattern. I just had a question about the colors, on the top in the section labeled “Here’s what you need” you say you need 3 colors of worsted yarn, so what color did you use for your fourth color? Thank you for any info! I am making the traditional hexagonal African flowers-do you put them together the same way? Is it chain 5 in row 2 correct?? My flower looks all bloated? Yes. When you work in those chains on the next round your flower will fill in. I l9ve this! I love your color choices. I am wondering what yarn amd colors you used. Hi Nicole 🙂 I used Knit Picks Brava Worsted in cream, wine, and camel heather. This is so beautiful! I love the colors. I came across this pattern today and absolutely love it! I’m thinking of doing the motifs in white and blue for a snowflake effect. how many motifs does it take? Can you give me an estimate? Thank you so much for sharing! I have been looking for a gift for a special person and I found it here! So just know that your generosity will be going to someone who also shares and gives to others. This is absolutely gorgeous. I can’t wait to try this. Do you have a video turorial? I haven’t done a LSC before and I am a bit confused… Could you maybe explain it a little differently? Thanks! Long so single crochets are worked over the stitch below it instead of into it. So you are really working a single crochet in the row below. Make sense? Thanks for sharing! I been looking for a new project for my living room. Meant joining my motifs now. Did you embroider the joining red areas together? Love this pattern. I’m not joining my motifs and did them as I went. Did you do each row than join the rows, or join as you crotched the edges? I’ve completed the first row and now have noticed that each motif in a row is joined only on the two bottom areas where I’ve joined the last two petals at two areas, thus making it joined to the next motif 4 times. Guess I’ve goofed somewhere. Any enlightening on this will be helpful. Hi Karen 🙂 I joined my while working the last edging round of each flower. 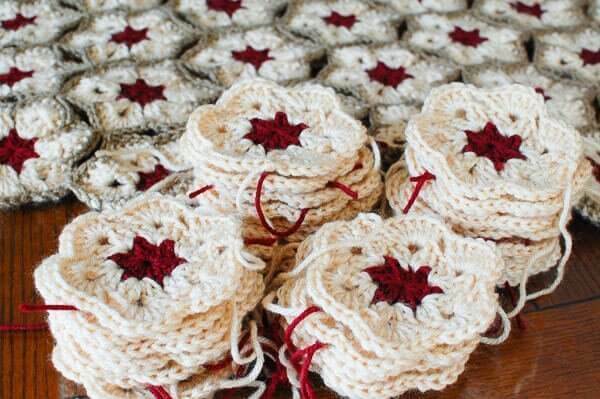 Each petals should join to an adjacent petal except for in the outer rows of your blanket. Make sense? The red triangles on my joining diagram indicate the points at which each flower joins another. Hope that helps! Yes, it’s makes sense. Thanks so very much. I love this pattern and will just need to put the rows together since I’ve done all the motifs together. I have been wanting to make this flower and putting it off. I now am going to make it. Thank you soo much I have been crocheting MOST of my life Learned from books. My MOM started me with the basic stitches. I will be 82 years young next month. I am still learning. So much to do. Happy early birthday 🙂 I love learning new things too! Thanks for the birthday wishes I have so much i want to do and so little time. Still trying to figure how many 50g balls I need for a throw please? Hi Vicki 🙂 This is still a work in progress for me too so I’m not sure what my final yardage will be. How many skeins of each color will I need to make this project? skeins it took. I think a lot of afgans use about 50-60 oz. I was hoping this was close to that! LOL! Don’t feel bad, i still have those kinda projects that have been sitting around the house for a year “unfininished”. I tend to see new patterns that i “suddenly” need to make! LOL! Hi, I started this project when all free crochet posted it on Facebook, I got a little sidetracked until today when I decided to pick it back up again. This is such a fun pattern, and so easy to! My only question is how many motifs would it take to make a throw. I’m not sure how big a throw should be but something that you snuggle up with while watching tv. Any ideas? Hi Sam 🙂 I am so glad you are enjoying the pattern! Good question … it really depends on how big you would like it to be. I usually just keep making them until I reach the size I like (or am sick of the project, hehe 😉 ). A typical throw is usually about 50 in. by 60 in. Ahhh, a Jewish star! Few patterns are available. Thank you! Thank you for sharing this lovely pattern. Love this pattern! Thank you for posting it. I would like to know how many motifs did you make. I’m not sure if you made 11 motifs or 77 motifs per your diagram. Much appreciated. I will be making this for my mother, I think she’s going to love it! Hi Judy 🙂 The diagram represents 11 motifs. hello. thank u. it is grate. what if you had the acrobat reader download link, for your beutiful free patterns! I too would love to make this but unfortunately you lost me in round 2. Is there an easier way to explain this? Sure, Heather 🙂 I will try to spell it out with no abbreviations. Maybe that will help. Join your next color in any of the spaces left by the chain 1s from the previous round and chain 3 (the chain 3 counts as your first double crochet), work 1 more double crochet into the same chain space as you joined the yarn, chain 5 and work 2 more double crochets into the same chain space again (this gives you the [2 dc, ch 5, 2 dc] cluster). *Now chain 1 and work 2 double crochets, into the next chain 1 space, ch 5 and work 2 more double crochets into that same chain space again. Now repeat from the * 4 more times, chain 1 and join with a slip stitch in top of beginning chain 3. Make sense? Hello! I love the pattern it’s gorgeous!! But I would like to do the same color story you did. What is the brand name and name of color yarn your used? Absolutely love this pattern and the colors that you used. Can you please tell me what these colors are and the name of the yarn please!! Thanks for always keeping it free and real!! HI Brenda 🙂 Thanks for your sweet comment! I used Knit Picks Brava worsted in Wine, Cream, and Camel Heather. I love this pattern but started crocheting late in life and on my own. I can’t seem to follow the written instructions so should you ever do a video on this pattern I would love to try it. Your work is beautiful. Round 1: Ch 3 (counts as 1st dc), work 1 dc in ring, ch 1, *2 dc in ring, ch 1, rep from * 4 more times, join in top of beg ch 3, fasten off — 12 dc and 12 ch-1 sps. 12 dc and 6 ch-1 sps. I have talked my mother-in-law into teaching me to crochet because of this beautiful pattern. You mentioned that you left the last round off that made it a hexagon. Could you please share the original pattern directions as I’d like to make it as a throw and think I will need the extra “coverage”. Thank you! Yay! I am so happy to hear that. I hope you love it as much as I do. You can fi the 4th and final round of the traditional African Flower motif at the very bottom of this post. I too think thisis beautiful…I love looking at the things you make. I think this would also make beautiful placemats, a square bag, ifvyou did it with thread it would make a beautiful tablecloth ….thanks for sharing, I look toward to seeing your next project. Forgot to click on boxes below to receive emails of comments. Like Pat above, I am also interested in knowing what the 4th color is. I absolutely love this! The colors are beautiful. And thank you for the join as you go instructions. I’ve seen them in other patterns but this is so much clearer. My only question is about the magic ring I have been crocheting for years and have not seen that term in crochet before, I know how to make a ring with chain stitches and I guess I am just used to the old fashioned method of chain so many and join so what is the secret to this magic ring? Hi Donna 🙂 there should be a link in the post for a tutorial on the magic ring. But if you feel more comfortable chaining and joining to make a ring, that works just as well. Hope that helps! Thanks I just found the tutorial very interesting. I am learning this site, so sorry if it was an obvious answer. How many chains to begin? This is such a pretty pattern. I am hoping it will work for a table runner. Thank you for sharing. I love your granny hexagons! What is the fourth color in the African Flower pattern? 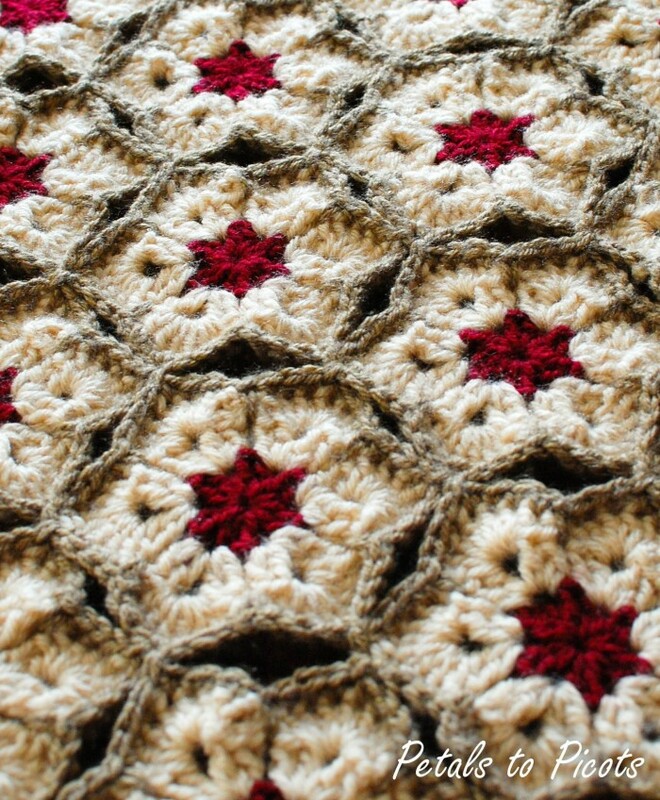 I have started on the Granny Hexagon pattern and the suggestions for selecting colors are very helpful – in fact right on! Thank you!! pinned!! I love african flowers. I really need to make a bag or afghan one of these days! So glad you like it, Anita! Gorgeous! Thanks so much for linking up on Hookin On Hump Day! Hi Cheryl 🙂 CD stands for color D. Hope that helps! Thanks, Tatsme 🙂 Glad you like it! So beautiful! Thank you for sharing the pattern! I’ve never seen granny squares in a flower shape before, Kara! Is there anything you can’t do with a crochet hook? You are so talented! This is very beautiful! I’m definitely interested in making my own. About how many ounces/yards would I need of each color? Hi Sharleen 🙂 I’m not sure yet how much it will take for an afghan since I am still in the process myself. I just try to order colors that are usually in stock and don’t have a dye lot. That way I can order more as I go. Hope that helps! Glad you like it, Linda! How do you make a magic circle?